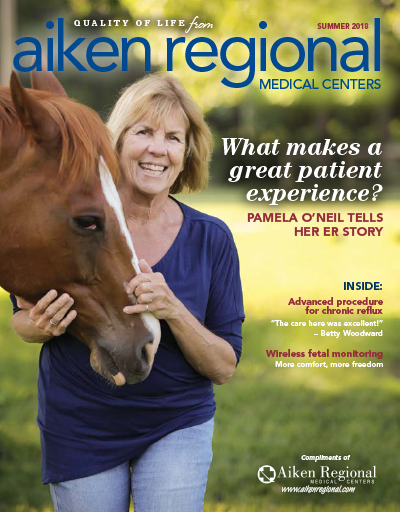 Quality of Life from Aiken Regional Medical Centers is a publication designed to bring you the latest news as well as health and wellness information you can use throughout the year. You can read the latest issue here, or sign up to have Quality of Life mailed directly to your home. Aiken Regional's Patient and Family Advisory Committee works to improve patient experiences. "I Had the Best Hospital Experience!" Pamela O’Neil, 65, went to Aiken Regional’s emergency department. The care she received was nothing short of stellar. "I didn't have any more time for reflux!" An incisionless solution for chronic acid reflux is here. New technology means more comfort and freedom for moms-to-be.